Learn how to meal prep Healthy Chicken Parmesan so you can enjoy your favorite comfort food throughout the week while sticking to your clean eating plan! First start by preheating your oven to 500 degrees F.
In a large mixing bowl, combine almond meal, chickpea flour, dried oregano, dried basil, dried thyme, garlic powder, sea salt, and black pepper. Dredge the boneless, skinless chicken breasts in the seasoned almond meal mixture and then shake off any excess. Heat olive oil in large oven-safe skillet over high heat. Add the coated chicken and sear until golden-brown on both sides, about 2 minutes per side. We aren’t looking to cook through, just get a nice golden crust on the chicken. Pour the tomato sauce over and around the browned chicken. Sprinkle a little grated parmesan over each chicken breast. Then, place in the oven for 8-12 minutes, until the cheese melts and the chicken is cooked through. Then remove it from the oven and allow to cool. While that’s cooling, make the zucchini noodles. Using a Spiralizer, make the zucchini noodles. Heat olive oil over medium-high heat in a large sauté pan until it’s hot. Then, add the zucchini noodles, sea salt, ground black pepper, and granulated garlic, and toss to combine. We don’t want to cook the zucchini all the way here - we’re just looking for it to start to cook and heat all the way through. When we reheat it later, it’ll finish cooking and be perfectly tender and not mushy. So, remove the noodles from the heat after about 2-3 minutes and let cool. 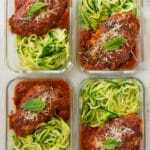 To assemble our chicken Parmesan meal prep, start by adding the cooked zucchini noodles to one side of your container, then top with the cooked chicken Parmesan.